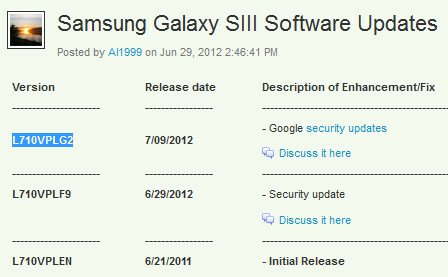 At the end of last month, Sprint downloaded a security update for owners of the Sprint branded Samsung Galaxy S III. The update apparently didn't stop the device from being vulnerable as Sprint has once again pushed out another security update for the phone. The OTA update will not result in any changes that you will be able to notice. We will repeat the same question we asked last time. You didn't expect Android 4.1 so soon, did you? Sprint suggests that you have your battery at the 50% full (or is that 50% empty?) mark before embarking on loading the OTA update. The new software version being installed on the phone is L710VPLG2. 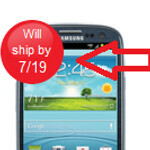 And while Sprint customers are getting their new handset updated to be more secure, Verizon customers have just been on the receiving end of pre-ordered Samsung Galaxy S III units. On Sunday evening came word that Verizon's own web site was promoting a July 12th launch of the device in Big Red's retail locations. Now, another look at Verizon's web site shows that those pre-ordering the phone now won't have it shipped until July 19th. I know, but it's one thing if the date is pushed back once, twice, but were talking about three times here, and pre-orderers like me who didn't even get theirs yet --- which took the entire point out of even pre-ordering. And it's not like they just kept moving it back. It was set for July 9th first. Then pushed back to 10th which was fine. Then 11th which got annoying. Then back to 10th which was a sigh of relief, then ... 12th? It's pretty embarrassing to think they don't have an accurate measure of how many devices are being requested compared to how many are available this close to release. Not even the iPhone 4s release was knocked around this much. 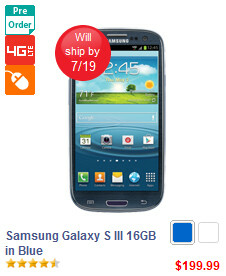 I ordered my 32gb blue galaxy s3 on june 20th through verizon and I just got shipping info due to be delivered 7/11. Yeah, I preordered on the 27th, and mine shipped yesterday. I'll have it tomorrow. They are not waiting, mine was shipped 7/7 and I think the date on there web site reflects when it will be shipped as if you were to purchase it today not when the pre-orders ship. I believe most pre-orders have been shipped. That's what happens when you catch the shiny phone syndrome. Fortunately, more and more people are going android, and avoiding the shiny phone. I wish Sprint would already send out ICS for the Epic Touch 4G along with the security update for the SGSIII. Now every articles mentions Galaxy S3 next time will be iPhone 5 turn. Is Samsung let a person who destroyed Samsung image by microwaved and burned the Galaxy S3 go free with free new phone like that. If you do that to iPhone you will be paying the investigation fees and jail time. I absolutely love the sgs3 but I can't help but wonder if that was actually the truth covered up. Samsung can play dirty as well, or any company for that matter-it's business. Chalk it up as a learning experience. For Samsung, this is unprecedented: getting the same phone to launch across all four major carriers at the same time takes some serious logistical juggling skills, especially with possibly the most highly demanded phone in history. Hopefully next year they'll have a better idea of how many resources to pour into the GS IV. Ladies and gentlemen be patient, Verizon is just making sure they have enough locks for everyone. I ordered mine yesterday, do you guys think it will come the 19th or 12th? i ordered mines on June 8th and it's still not here. Check on Verizonwireless.com for an update and they removed the expected ship date all together. So much for a loyal customer.